Jacksonville Maid Services is the premier Residential and Commercial Cleaning Company in Jacksonville, and one of the lead suppliers of janitorial services. Our priority is making sure you are 100% satisfied with our commercial janitorial services. Our team members are highly trained and passionate about making sure everything is spotless. There’s nothing better than a professional “mom” cleaning for your home or office! We’re The Leading Janitorial Services In Jacksonville! First of all, allow us to take care of your commercial office cleaning & janitorial service needs so you can focus on different, more important aspects of your business. We take a consultative approach with all of our clients to make sure we set the right expectations and we deliver on our promise. Every client is different, which is why we’ll set you up with a plan that fits your needs at an affordable price. Secondly, our janitorial services don’t just clean – they sanitize. Our constant innovation is what makes us the premiere office cleaning service in Jacksonville. We use brand new dusting cloths every single time to avoid bringing other people’s dust mites or allergens into your home or office. We also use top-of-the-line vacuums. This combination allows us to work smarter and faster. We always look for ways to improve efficiency without ever sacrificing quality. Who would’ve thought you can apply science and process flows to our janitorial services? Having two divisions, a Jacksonville maid service and a commercial cleaning service (including janitorial services), we are able to pick and choose the best techniques from both worlds to deliver spotless results to your world. 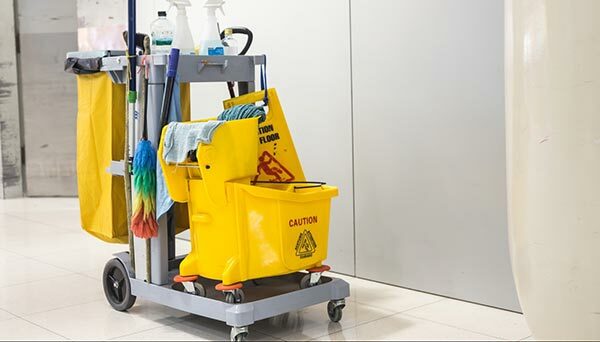 When it comes to having a clean office, getting proper janitorial services is essential to your business. We understand that and, as a result, strive to ensure you’re met with the cleanest office space possible! We believe your satisfaction is the most important aspect in our business. As a result, if you’re not completely satisfied we’ll happily return and and redo our janitorial services. Give us a call! We’re incredibly proud of our employees and think you will be too. Every member of our team is thoroughly screened, insured, and bonded. Plus, our cleaning professionals are all local to the Jacksonville area to ensure quick response times. Your business will be cleaned by the same team on each visit (excluding things like individual employee vacation or illness). This means your cleaning team will quickly learn the specifics of your business and what you require. You’re not just hiring generic janitorial services; you’re hiring experts in your unique facility. We have the capabilities of a large company while still keeping that personal, family-owned business feel. When working with Jacksonville Maid Services, you’ll be assigned a local specialist. Check out our Service Area – we’re probably closer than you think! Jacksonville Maid Services was founded over 19 years ago. Our president is someone who’s put everything on the line to make sure our clients are as happy as possible. Our core values have never changed – we believe in providing quality janitor services based on the specific needs of the customer, all while offered at a fair & affordable price.